You are here: Home / Analysis / Video: How Could Paris Climate Talks Ratchet Up To Success? Video: How Could Paris Climate Talks Ratchet Up To Success? How could the UN climate talks in Paris next month ratchet up the national plans (INDCs) and succeed in limiting global warming? Drew Jones of Climate Interactive presents scenarios from the C-ROADS simulation and explores how far these contributions get us, and what more is needed to keep warming to within 2° Celsius (3.6°F) of temperature change above pre-industrial levels. This video reviews contributions that countries are making and how far they take us to addressing climate change. It explains some of the assumptions that go into making assessments of the temperature impact in 2100 given the current plans have. Additionally, the video reveals the pathways that could be followed to build on the INDCs and make the deep emissions reduction commitments needed to achieve the international goal of keeping climate change below 2°C. The analysis comes from the Climate Scoreboard Climate Interactive has released, using the peer-reviewed freely available C-ROADS climate policy simulator developed in partnership with the MIT Sloan School of Management. Sir Robert Watson, former chair of the IPCC, led the external review of C-ROADS, which asserted that it was rigorously designed and suitable for widespread use. Script and scenario design: Drew Jones and Climate Interactive staff. Production, edits, and graphics animation: Robert Klein, Klein Digital. Simulation scenario creation: Lori Siegel. Direction: Dayna Reggero. Filming and lighting: Peter Brezny. Our funders. Thanks for the clear and open access approach. 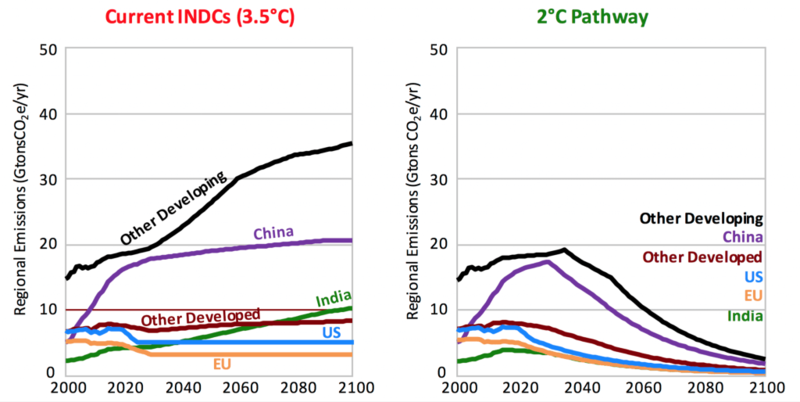 I may have misunderstood something, but looking at the 2°C curve I couldn’t see how the cumulative emissions fit with the 50% chance of 2°C carbon budget from the Synthesis report. Checking the accompanying excel sheet the CO2e emissions from 2011 to 2100 for the 2°C pathway totalled 2789GtCO2e. With a very simple assumption that 20% of this relates to non-CO2 emissions, the remaining CO2-only budget for 2011 to 2100 is ~2231Gt. The synthesis report’s headline CO2-only budget (for 2011-2100) for a 50% chance of 2°C is 1300GtCO2; (range of 1150 -1400Gt). Even for a lower chance of 2°C (~33% of not exceeding; or ~67% of exceeding) the headline budget is 1500Gt (range 1150-2050). Consequently, I can’t reconcile the CO2-only budget of your 2°C pathway with the CO2-only budgets (headline and range) from Synthesis report. This is the case for both 50% and 67% of exceeding 2°C. Am I missing something significant? Many thanks in advance for any pointers you can offer to explain this difference. Great summary of the current state of play, thanks guys ! Your assumptions are predicated on climate response models that are overly conservative. The rate of warming as measured by ocean heat content changes over the last 4 years shows that we have DOUBLED the top-of-atmosphere energy imbalance from 0.6 watts per meter squared to 1.1 watts per meter squared in the last 7 years. The lapse rate and water vapor feedbacks respond slowly (10 years to reach full feedback) to a pulse of GHG emissions. Therefore we are currently operating on 2008 (or so) atmospheric abundance levels. Aerosol emissions associated with fossil fuels are masking approximately 1/2 of the total energy imbalance experienced by planet earth. Any aggressive emissions reductions will necessarily reduce aerosol emissions and the locked in warming at current GHG abundance levels will push the Earth above 2.0 C in the next 25 years. In addition, forest biomas declines, tropical peat fires (see Indonesia) boreal forest and peat declines and the rapid increase of permafrost disassociation will ensure that even if we reduce anthropogenic GHG emissions to the levels you state, we will still have a strong likelyhood of reaching 4C by 2070. It should also be noted here that approximately 20% of the total earth energy imbalance results from the albedo change of a melting polar ice cap. This will reach ice-free conditions sometime around September of 2022. We must do much more than these COP21 goals state. Only by removing billions of tonnes of CO2 from the earth’s atmosphere and reducing CO2 abundance below 350 PPMv will we allow for a dystopian future for our children, (as opposed to no future whatsoever). P.S. we are currently at 1.1C above pre-industrial temperatures. Does your study take into account increased methane releases from the artic as temperatures warm? Also does your study take into account the westernisation of the developing worlds diet and the extra carbon producing all that extra meat and dairy will take? More greenhouse gas emissions in the atmosphere will continue to absorb more infrared rays, until such time that they are removed from the atmosphere. 2100 is 82 years in future, but it is not the end of time. Earth will continue to get warmer post 2100 under all emission scenarios. Within this context, it would be helpful to model the temperature rise through to say 2200, 2300, 2400 and 2500 so that we get a sense of whether we are on a path to extinguish life on earth in a historically speaking, a short period of time. I am interested to know what future we are leaving behind for our children, their children, and their children and so on. I would like our grandchildren to say that we took collective action now to avoid a disaster for their grandchildren. I am convinced that as a species we are falling way short of the mark. Longer-term scientific forecasting may help focus all our minds, and our politicians.